Red Bank, NJ - Diversified Graphic Machinery recently installed its exclusive Foildex™ Cold Foil indexing technology as well as Filmdex™ UV Cast and Cure™ technology on a 40 inch 8-color manroland HiPrint press at Carlson Print Group in Minneapolis. 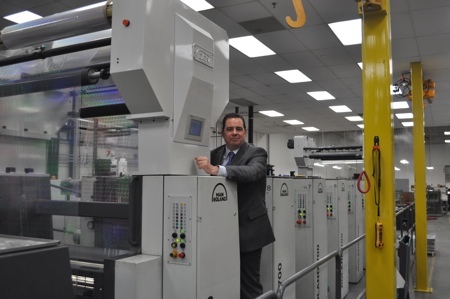 "We are extremely proud of the installation at CPG,” said Michael DeBard, President of Diversified Graphic Machinery. "After looking at our Foildex™ system for many years, Carlson made the decision to move forward with DGM. Carlson is one of the only companies with this unique print enhancement technology that can run Cold Foil with Indexing, print and UV Cast and Cure simultaneously. Carlson has also installed a very unique UV LED System in the manroland HiPrint press.